Project Builds Report page displays project builds and its information provided with search criteria. 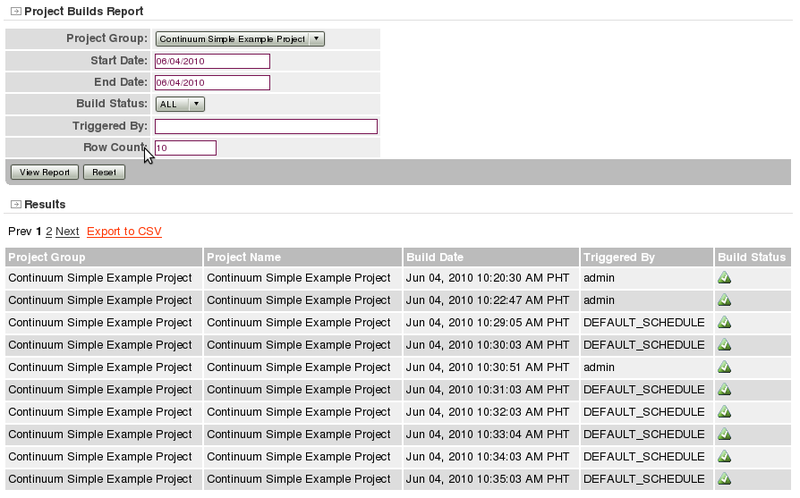 Searching using the default values of the fields will display all the project builds. Project Group - selected from the list of existing project groups. Default value is ALL. Build Status - selected from the list which can be ALL, Ok, Failed, or Error. Default value is ALL. Triggered By - user or build schedule which triggered the build. 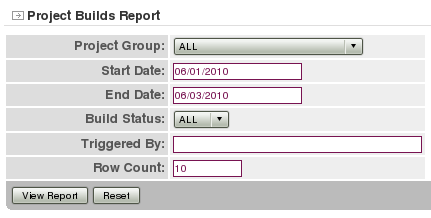 Row Count - sets the display of the number of build results to be displayed in a result page. Default value is 30 and the minimum required row count is 10. To generate the report, click the View Report button. To restore the default values of the fields, click the Reset button.